When considering flooring options, ceramic floor tile is very popular and a great buy. Ceramic tile has many beneficial qualities presenting a look similar to the more traditional, luxurious stone tile floor yet with simpler maintenance and a much lower cost. Ceramic tile comes in a wide variety of shapes, sizes, finishes and colors perfectly suited for your kitchen floor tile project, bathroom tile design or almost anywhere else in your home. So, finding that "perfect" tile to complement your design theme will be easy. You should know..... that not all ceramic tiles are the same. They are all basically clay that is formed and fired in a super hot oven called a "kiln." But the type of clay, baking temperature and time determine how hard, porous and durable the ceramic floor tile is and whether it is suitable for outdoor use or in cold weather for say... an entry or patio. Ceramic floor tile is available in countless colors, patterns and textures. Traditionally, neutral colors where the main offering with white and almond the most common. Today, neutral is still popular, but the style and design of ceramic tile has evolved to include colors A to Z.... a broad range of decorative styles and.... very good imitations of natural stone such as marble or travertine. Also, you can paint ceramic tiles to create a mural, design mosaic or additional style element. You can paint ceramic tiles located on any surface except where exposed to excessive moisture like a shower. Often people will wonder why the color of their tile is not all the same. Well... manufacturers box and sell a certain ceramic floor tile color and pattern, but they purposely create variation in the shading of that particular color. The end result is a more pleasing natural appearance once installed. So.... it's normal to have color differences. Most ceramic tile is "glazed." After the tile is fired in the kiln, a glaze is applied that gives the tile it's color. The glaze can be a high-gloss, semi-gloss, matte or a rougher non-slip surface good for wet areas. Glazing makes the tile surface highly resistant to wear and easy to clean. Unfortunately, the glaze is just on the surface, so if the tile is scratched or chipped you will see the dull gray or brown color under the glaze. Other home and kitchen floor tile options like travertine or porcelain do not have this problem, since their color is consistent throughout the tile. Ceramic flooring comes in a range of shapes and sizes (just like other tile options) to make creative patterns for your kitchen floor tile project or a bathroom tile design. Most tiles are square, but rectangles, hexagons and octagon tiles are available too. Most popular are the 12 x 12 inch tiles, but larger 18 x 18 inch and even 24 x 24 inch tiles are increasingly used. Also available are 1 x 1 inch tiles that you can use to create a mosaic of color/pattern as an interesting visual element. Other sizes include 2x2, 6x6, 8x8 inch, 6x8 and 8x10 inch tile. You'll also find a variety of edge styles: straight, beveled, scalloped and cushioned. 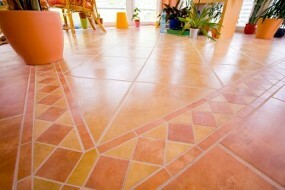 Care and cleaning of ceramic floor tile is super easy. Ceramic is not affected by most normal household cleaning chemicals, so no worries about what is used to clean it (although it is best to stick to mild cleansers). Hot water is perfectly fine. Using bleach or ammonia too much could affect the grout color. Sweep and mop regularly and your ceramic will look great. Glazed ceramic floor tile is essentially water-proof and does not stain, however, the degree of porosity does vary. For installation locations consistently exposed to water (showers, outdoors) it's important to choose a ceramic tile with low absorption and rated (vitreous / impervious) for use in such environments. Some tile is not glazed and may need sealing just like you would some natural stones. Ceramic floor tile has several other features that are typically not a major factor in the buying decision, but nonetheless are beneficial. Fire resistant... won't smoke or burn. Thermal shock resistant... so it won't crack or deform under extreme heat. Hygienic... so it doesn't harbor bacteria. Color fast... so it's color won't fade in the sun. Those rated for outdoor use are frost resistant... so it won't crack in freezing temperatures. All in all ceramic tile flooring has many benefits and few drawbacks... a good, economical choice for any floor in your home. For more Ceramic Tile Flooring Pros, Cons and Comparisons...click here!